On my travels I do not only like to meet locals, I also enjoy meeting other travellers. Mostly those are other overlanders but sometimes I also meet some special backpackers. Here are the travellers that I have spent some time together with. Those are friends from Switzerland and we actually flew over to Canada together. However we split up on the first day to follow different plans and schedules. 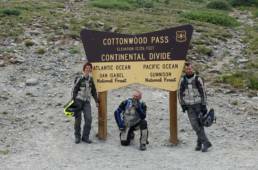 I did meet them again for some joint off road riding in Colorado and Utah. I met Michelle in a national Park in the north of Baja California. Further down the road in Mulege I was invited by them for a seafood dinner, where I also met Evan. 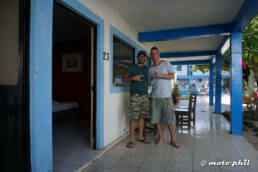 I met Laurin in the Hotel in Mulege. 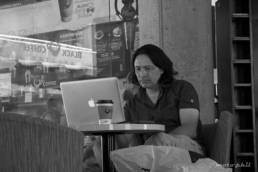 He’s a long term backpacker with an interesting project: Volcanos and the people around. Look forward to read more from him! In La Paz I saw them riding down the street, I knew it was them because I saw on FB they were around. We took the same Ferry to Mazatlan so had some time for a beer and good conversations. They are a family of three travelling on two BMW’s while homeschooling their daughter on the road, respect! Great guys! 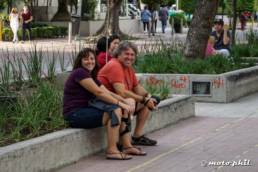 In Guadalajara I was happy to meet the cool couple Michnus and Elsebie from South Africa. Very experienced travellers and a lot of fun to hang out with. What a fun couple to hang out with! 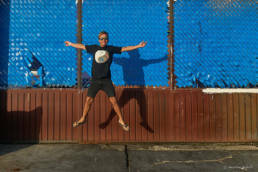 I did that in the Overlander Oasis in Oaxaca and they have many stories to share. 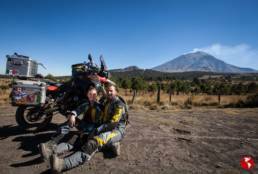 Before the couple started travelling together in their Landcruiser Kölbi was also travelling far on a motorcycle. About Ushuaia he says “in my opinion it’s a waste of fuel”. 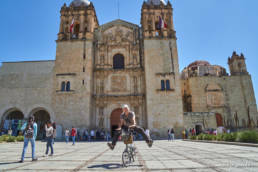 I met “the Greeks” while in Oaxaca. They have been on the road for many years and will be for many years to come as their slogan is “TraveLiving”. 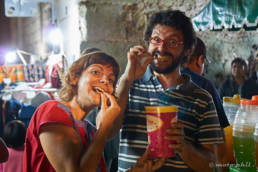 A great and fun couple to hang out with and they can cook some awesome greek food! 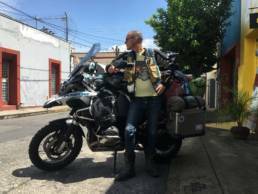 Hank is currently not a traveller anymore (though he was), but he came to Oaxaca to meet PikiPiki and that’s when I met him. He’s a great guy and a very good photographer. If you pass through texas and need help with your BMW he can help! When in San Cristobal de las Casas the hostel patio was already filled with 5 (!) DR650s, but there was that ominous purple KLR650 around as well. It turned out to be Patrick’s bike. 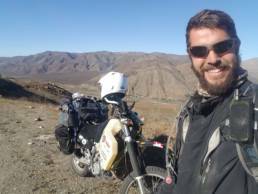 The swiss started his trip by backpack in Alaska but spontaneously decided to get a motorcycle instead. 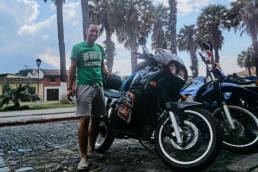 I met the young finish traveller at the hostel in Chetumal, we enjoyed some good conversations about travelling and personal growth together over a beer and some cigarettes. He’s much wiser than his age would suggest. Great guy! 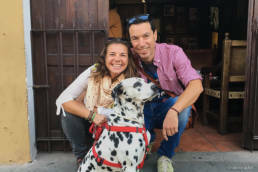 Austrian-Swiss couple travelling in their small campervan with Gina, their dalmatian dog. Friendly fellows that I have met at the border crossing from Belize to Guatemala and then in El Remate again. “The dutchies” as they were called by PikiPiki. 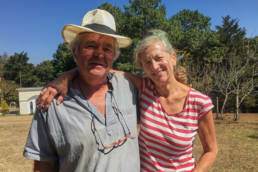 A lovely and fun couple from, guess where, the netherlands. Met them in El Remate and then for a few days more at Finca Ixobel in Guatemala. They would like to get a TukTuk to continue their travels in their own vehicle. I hope they can get a good deal, would love to see how it goes. 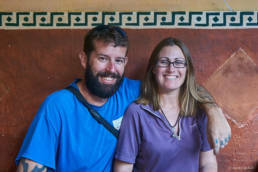 I have been in contact with the german couple before I got the chance to meet them in Guatemala City. They started their journey about at the same time than I and they are also from the breed of slow travellers. I enjoyed exchanging stories with them on the campsite. 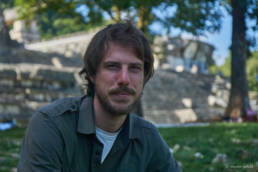 Philipp is a brewer and part of their trip is to visit many local breweries and taste the beers of the americas. 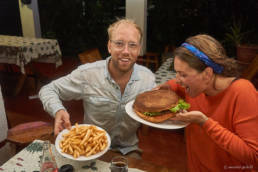 I met the nice swiss/german couple at Cabana Suiza in Guatemala. They are travelling up north in their Van and have many stories to tell. They are definitely the kind of travellers that care a lot more about the people than sights in the places they visit. They do not have any social media presence or a website, if you want to contact them I can help you out. 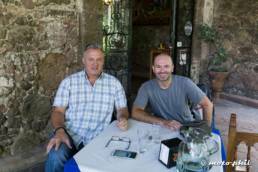 I met the two Aussies in Antigua Guatemala after having been in contact for a while on facebook before. 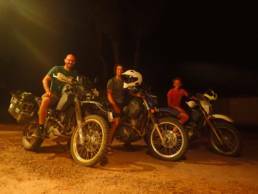 They are travelling on australian post bikes, some Honda 110ccm but the engine was replaced by a chinese 125ccm. They will probably be for many more years on the road. When I went to MotoCamp in Antigua I saw a german Triumph standing in front of it. 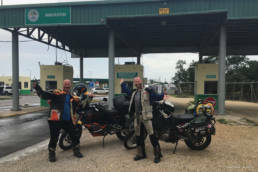 I asked around and shortly after met Dirk who is travelling north and central america on his bike. Cool dude, after 3 months in Antigua almost a local and he knew some good places to go and hang out.